Raldbthar is a Dwarven ruin located in the mountains west-southwest of Windhelm, between Lake Yorgrim and the White River. It contains two interior zones: Raldbthar and Raldbthar Deep Market. It is inhabited by bandits, Dwarven automatons, and Falmer. A small group of leveled bandits has set up camp outside the main entrance to Raldbthar, and will attack on sight. It is possible to jump up to the upper portion of the ruins, where you can find a silver ore vein behind a tree, an alcove containing an expert-locked Dwarven chest, several Dwemer metal items, ingredients and a filled random soul gem, as well as a locked enclosure that, once unlocked from the inside, allows access to a Dwemer lift that will take you straight down to Raldbthar Deep Market, and a moonstone ore vein just up the hill from the lift. The first section of this zone is inhabited by a large group of bandits, who have cleared out the few Dwarven automatons that guarded the entrance area. The bandits are led by Alain Dufont (if you do not yet have the quest Mourning Never Comes active, see notes below before killing him). Dufont carries the unique, enchanted warhammer Aegisbane. Upon entering there is a short passage with various items of Dwemer metal scattered across the floor. Ahead on the left are two unowned bed rolls, one of which is occupied by a sleeping bandit, with a food barrel beside them. Opposite these is a cart containing more Dwemer items that can be smelted down into Dwarven metal ingots. Past the bandit is a knocked down gate with two flame spouts firing intermittently, horizontally across in front of a second gap, with a charred skeever on a rack to the left being cooked by them. There is a passage to the left of the flame spouts leading into a domestic area with stone beds and tables and chairs, with several bandits patrolling or sleeping in this area. There are Dwemer items found on the floor, tables and shelves. As you pass a caved-in section there is a shelf on the right beside a metal dresser with three Dwarven arrows on top. A bandit is patrolling ahead. There are two stone beds opposite, but they are unusable. Further along the far wall is a table with a sweet roll and a copy of The Aetherium Wars(DG) on top and a woodcutter's axe on the floor beside it. To the southwest is another bandit near a campfire. To the left of this bandit is a room containing five stone beds, two of which are occupied by sleeping bandits. There is also a table with a bottle of alto wine, five bottles of Nord mead, a red apple, a sheaf of wheat, and a random set of armor on top. By one of the beds is a pair of iron boots. By the fire is a baked potato, a loaf of bread, a carrot, two bottles of Nord mead, and some cheese. There is a workbench next to where the bandit was standing. The passage continues past these, before reaching a junction that descends to the right and enters a room containing two bandits and Alain Dufont, the bandit leader by a campfire or continues through a leveled locked gate. Beyond the gate is a ramp leading up to an area with an oil slick and out onto a balcony above the room containing Alain Dufont and two other bandits. From here you are able to fire two Dwemer ballistae at the group of bandits around the fire, possibly also igniting another oil slick that has pooled around them, making that fight significantly easier, but scattering various loot found in the area. This room can also be reached by passing through the flame spouts and descending to a master-locked gate that opens directly into this room opposite the campfire. There is wooden scaffolding descending from the balcony to the room below and two unowned bed rolls each with a random pair of boots beside them as well as the remains of a leveled Dwarven sphere and a barrel near the fire with a common book on top. Under the wooden scaffolding, very well hidden and partially in the dark, is an unlocked wooden chest. There is a locked gate underneath the balcony with another bandit patrolling the room behind and a long ledge separating the two rooms with metal grating above, there are many Dwemer items, a gold ingot, an iron ingot, a piece of iron ore, two bottles of alto wine and a copy of the Sneak skill book 2920, Last Seed, v8 on the ledge. The bandit will open the gate and join any fighting by the fire. The room under the balcony has suffered with cave-ins and fallen masonry lying in piles including an empty chest in one of the piles. Along the back of the ledge is an apprentice-locked chest, a food barrel and sack, an unlocked chest and a stone table with a random mace, a random potion and a random potion of stamina on top among several Dwemer metal items. Above the table is a wall shelf with a bottle of alto wine, a random helmet, a leveled potion of stamina, a leveled potion of strength and a random bow on top. Further to the left along the same wall the table is against is another unlocked Dwemer chest and at the rear of the room a master-locked gate up some steps. Behind this is a long stone table with an unlocked Dwemer chest, a two Dwarven metal ingots, three pieces of gold ore, a random enchanted shield, and three large coin purses on top. At the rear of the room is an unlocked door that leads further into the zone and to areas that are still guarded by several leveled Dwarven spiders and Dwarven spheres, a few of which will pop out of the Dwarven scuttles that abound in this section. The next room contains an apprentice-locked chest to the right and behind a pile of fallen masonry to the left is a small coin purse. Watch for several oil slicks that can be used to damage your foes, as well as a double spinning blade trap. Once past these and a steam piston, there is a novice-locked chest hidden behind some horizontal pipes, before a flight of stairs that leads up. At the top of the stairs are three alcoves. The first contains a workbench and a novice-locked chest, the second contains a stone table with several Dwemer metal items on top and the third contains a master-locked chest beside another table with the remains of a Dwemer spider and a random filled soul gem on top. More stairs lead up to a passage with scuttles on either side and at the end a lift that will take you down to the Deep Market. The lift down to Raldbthar Deep Market drops you off at the top of a short ramp protected by another spinning blade trap. At the bottom on the right is a novice-locked chest. 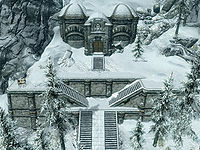 Doors open up into a large, multi-level chamber inhabited by Falmer and a pair of their captive skeevers in a gated pen on your right. Beside this is a tanning rack and on a ledge beside it are three leather strips and a piece of human flesh. In front is the body of a Nord. There are three Falmer Tents on the lowest level of this chamber, one on the left contains a small fire, one on the right with a small campfire in front contains a hay pile you can rest on. Beside the fire is a Dwemer pan, two skeever tails and a charred skeever hide. The final tent is at the rear of the chamber to the left of stairs leading up and this contains two pieces of chaurus chitin, an unlocked Falmer chest and a few human bones. At the top of the stairs is an apprentice-locked chest, with three charred skeever hides to the left and a small area to the right containing a Falmer tent. Just inside the tent is a weak poison. More stairs lead up from here to the first ramp that winds its way up to a platform where two leveled Falmer await. There are two empty tents on this platform with a campfire in front. A metal grating forms a ramp down to another platform where another Falmer is standing in front of another tent. Behind this tent is an unlocked Falmer chest and a ledge with several metal items, a magicka poison and a button that lowers another ramp from the first platform into place, enabling you to climb to a passage above. At the end of the passage another ramp descends to ledge with a passage behind a metal grating. This leads to another door. Beware the Dwemer ballista trap at the top of a flight of stairs just beyond these doors. It can result in enormous amounts of damage, but alert explorers can spot the pressure plate trigger and avoid it. Just past these stairs is another trap; this one a slicer also triggered by an obvious pressure plate. Watch out for Dwarven spiders and spheres emerging from more Dwarven scuttles in the next corridor leading to another set of large, double doors. On the east wall by the first set of slanted pipes is an unlocked chest. By the next slanted pipes there are several metal items and a random filled soul gem on the ground. The next corridor beyond the doorway contains a closed portcullis, and a platform set with four blue buttons. Pushing the first button on the left will trigger a set of flamethrower traps, while the button third from the left will lower the portcullis. There are three shelves on the right holding various Dwemer metal items, with more on a stone table around to the left. The next area is a large chamber inhabited by four leveled Falmer standing by the openings to four Falmer tents around the chamber, with a novice-locked room housing two chaurus or chaurus huntersDG, a stone table with a corundum ingot, two silver ingots, a gold ingot, a piece of gold ore, one of ebony ore, and three Dwarven treasure chests; one unlocked, one expert-locked and the third apprentice-locked. There are many chaurus egg sacs in and around the room and four loose chaurus eggs on a ledge at the front. There are three large shelves on the right holding various Dwemer metal items and beside these a statue of a head with two random soul gems beside it. The first tent on the right has an unlocked chest beside it, while the second tent on the right contains a Falmer bow. There is a fifth tent without a Falmer standing in front with an expert-locked gate on the entrance to the tent. Inside this tent is another unlocked chest. The bridge in this chamber can be lowered by removing bones or scraps from four jammed gears. One is located in the water under the bridge (sometimes this scrap is on the ground below instead of in the gear; interact with the scrap as you normally would). Another bone is under the gear on your right as you enter the room. The remaining two are in the far corners of the room. After removing the bones, go onto the platform and press the button to lower the bridge. Once lowered, the bridge releases a leveled Dwarven centurion. There is a large Dwarven chest next to the centurion's gantry that contains leveled loot and a door behind it opening into a passage that leads to spears blocking your way. On the left is a lever that will lower them allowing you to access a room guarded by two leveled Dwarven spiders and a Dwarven sphere. There is an adept-locked chest on the wall opposite and two shelves running most of the way around the room with many ruined books, a random potion of resist element, various Dwemer metal items, two Dwarven metal ingots, a gold ingot, a corundum ingot and a Dwarven helmet on them. A door opens into a small room containing an Aetherium Shard for Lost to the AgesDG and two unlocked chests guarded by a leveled Dwarven spider. Opposite this room is a gate with a lift behind that takes you back to the surface. If you have an attunement sphere in your inventory, activating the Dwarven mechanism in the center of the room will reveal a staircase. Following this staircase down leads to a short corridor ending at a set of double doors that let out into Blackreach. An expert-locked gate along this corridor protects two Dwemer treasure chests containing leveled loot. Alain Dufont is present even if Mourning Never Comes is not active. This can cause problems for people trying to complete the optional objective for that quest since it makes it very easy to kill him ahead of time, resulting in the optional objective not being available. You can kill all of the bandits in this area, even the ones sitting next to him around the campfire, and he will not turn hostile. However, if you get too close to him, he will tell you "I don't know how you made it this far, but you'll go no farther." and attack. If this happens, simply run as far away from him as you can and enter sneak mode. He will quickly lose sight of you and stop being hostile, allowing you to walk past him and continue on deeper into Raldbthar. He may also accept a yield if you sheathe your weapon. Using the console, you can also do prid 000D2AFF then disable, disabling Alain but not killing him. He should automatically be re-enabled eventually. However, if he does remain disabled, you can simply perform prid 000D2AFF again and then enable. The elevator leading to the surface is not reset when the corresponding exterior cell has respawned. The elevator can be reached again from the lower part of the exterior ruin by climbing the rocks and using the Whirlwind Sprint shout. So, if you have used the elevator in the first place to exit the ruin, you can use it again to access the final part of Deep Market leading to Blackreach. By doing so, you won't have to go through the entire dungeon again. If you return to the Deep Market after completing it once, the bridge may be up again. It's possible no bones will be in the gears, leaving no way to get the bridge down again. If the bones are there, you may not be able to interact with them properly (even if you dislodge them with a weapon, the gears won't turn). Use the console command tcl to float across the gap and through the raised drawbridge. Go to the end of the platform while the bridge is still up and use the Whirlwind Sprint shout to cross the gap to the raised bridge. At this point, you can use the clipping glitch to pass through the raised bridge. Once through, kill the Dwarven Centurion and you can continue as normal. If you return to Raldbthar during the quest Lost to the Ages, the bones will have been replaced in the gears and you will be able to interact with them normally, allowing you to progress through the dungeon. One of the bandits near Alain carries the Irkngthand Consortium Key, which doesn't open anything. This issue has been addressed by version 2.0.8 of the Unofficial Skyrim Patch; the bandit will carry the Raldbthar Key instead.